If you listen closely while out in Playa del Carmen, you’ll quickly realize how multicultural our beautiful city is. 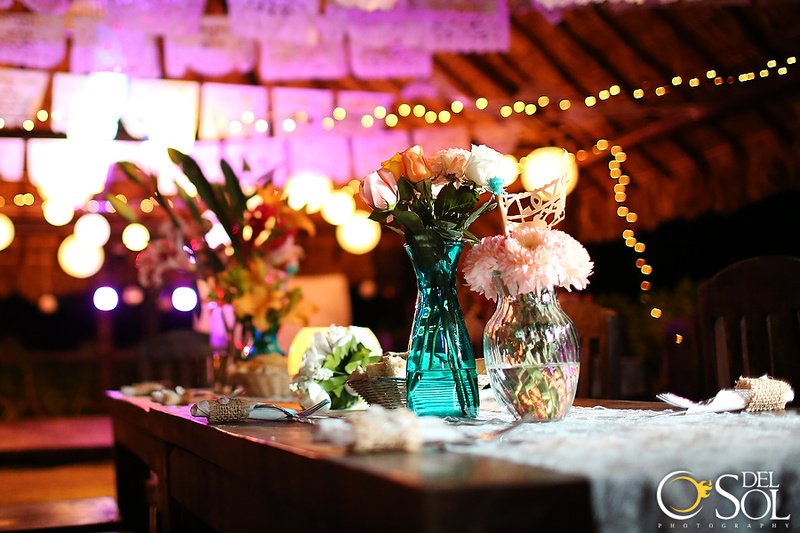 You’ll hear Spanish, English, Italian, Portuguese, French and many other languages being spoken in the shops and restaurants, and this is one of the many reasons we believe Playa is a perfect location for a beautiful destination wedding. Pontea and David came to us, and to Playa, with their Persian influence. They brought offerings and decor with them to help us create a traditional Persian wedding on the gorgeous secluded beach of the Grand Coral Beach Club. We incorporated a mirror (“the mirror of fate”) and two Candelabras (representing the bride and groom and brightness in their future), one on each side of the mirror at the ceremony site. Traditional offerings of foods and spices were laid out and guests got to witness this happy couple exchange vows with the help of their families. The ceremony was followed by dinner and dancing at the always beautiful and modern Grand Coral poolside reception area, decorated with white flowers, crystal vases and glowing candles. A DJ and band kept guests dancing and toasting the night away! As word continues to spread about how amazing the Riviera Maya is, with its stunning beaches, abundant hotels and resorts for every budget and taste and all of its natural beauty, it is no surprise we are seeing more and more weddings taking place here and every now and then we even get a celebrity appearance! Beautiful actress, Amy Davidson, known best for her role on TV’s “8 Simple Rules” and her fiancé Kacy came to us for their May 2010 destination wedding. Amy, always stunning with her flowing red hair and beautiful smile, wanted a simple and elegant ceremony and fun filled reception with beachy accents and bright pops of color. We drew inspiration from the bright colors in peacock feathers and incorporated them into the bouquets which complimented the brides hair and eyes perfectly. The ceremony took place under the romantic gazebo of the Gran Porto Real, in the heart of Playa del Carmen. Adding to the dramatic backdrop of this beautiful resort, were high winds as a Norte passed through our area! Not a problem for this spontaneous couple and their guests, they knew it would make for great photos! Playa del Carmen based photographer Zazil Graph was on site to capture the memories of this fun filled day and Ken Brownlee got it all on film. Thank you to our Fire Goddess Amy, Kacy and their wonderful group for allowing us to be a part of their special day! 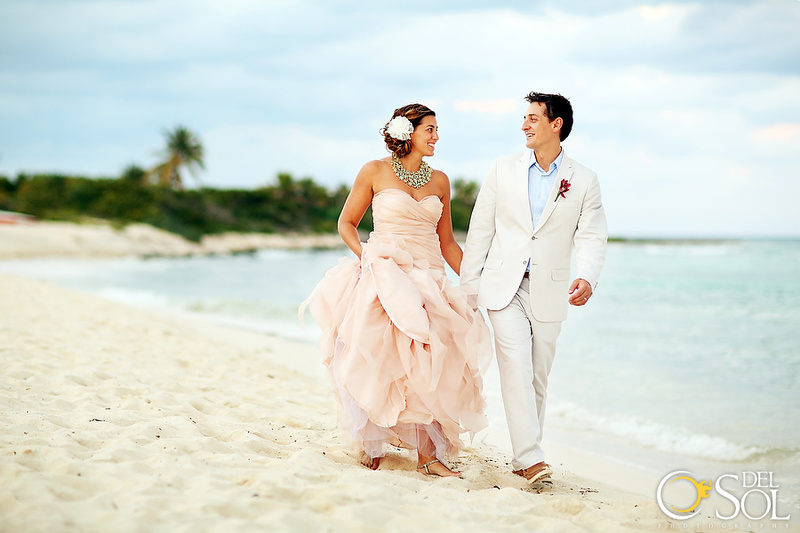 Christine came to us hoping to find her dream Mexican beach wedding venue. Her wish? Secluded, rustic and open air. 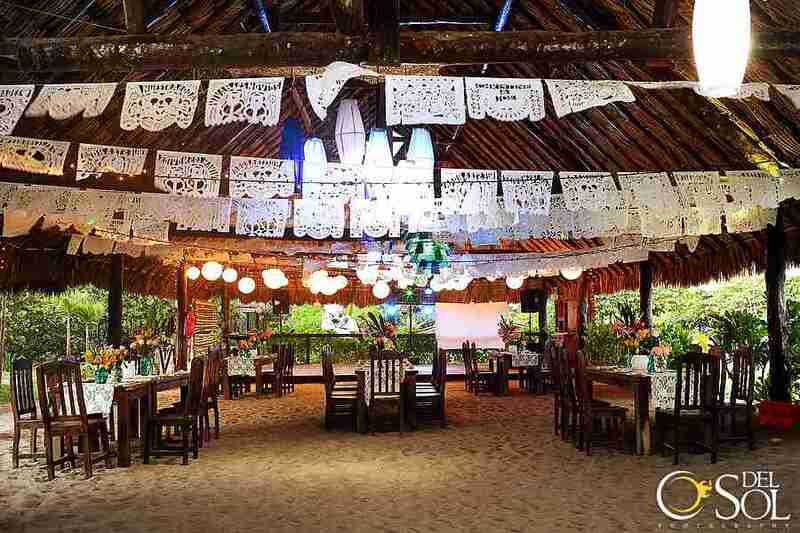 She imagined a big palapa decorated in traditional Mexican papel picado banners, a sea side ceremony and an authentic Mexican feel. We immediately suggested Blue Venado Beach Club, 15 minutes outside of Playa del Carmen. It was a perfect fit! Decor and details were on the top of this brides list. 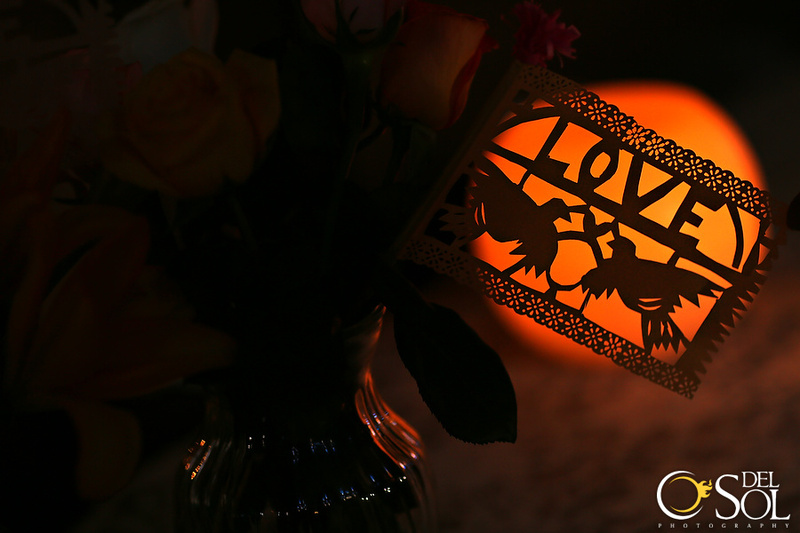 We worked on finding beautiful custom papel picado banners and strung them with tiny white lights to create the romantic and whimsical atmosphere. 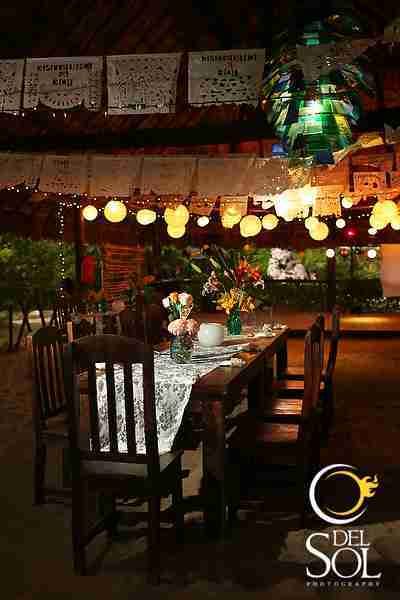 Chinese lanterns lit up the dance floor and a mix of beautiful fresh tropical flowers filled colorful vases that, mixed with candles, lined the tables draped in lace runners. 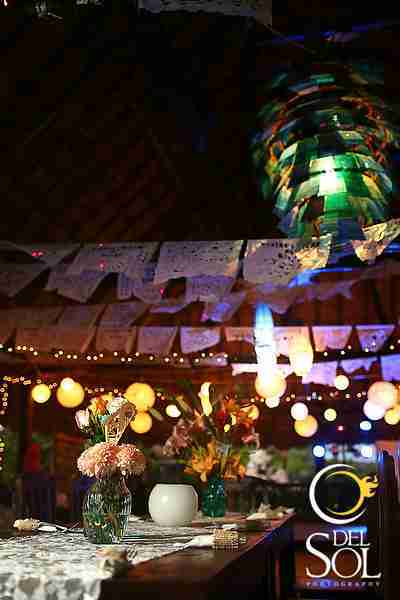 Personal touches, such as DIY mini pinatas, papel picado flags and cupcake toppers helped bring it all together and we were thrilled with the way we were able to transform the usually bare venue into a fun, festive and romantic setting for the couple and their guests who celebrated in the sand and danced the night away! Danay and Jon came to us looking for the perfect, private, beachfront venue to host their 70 fun loving guests. 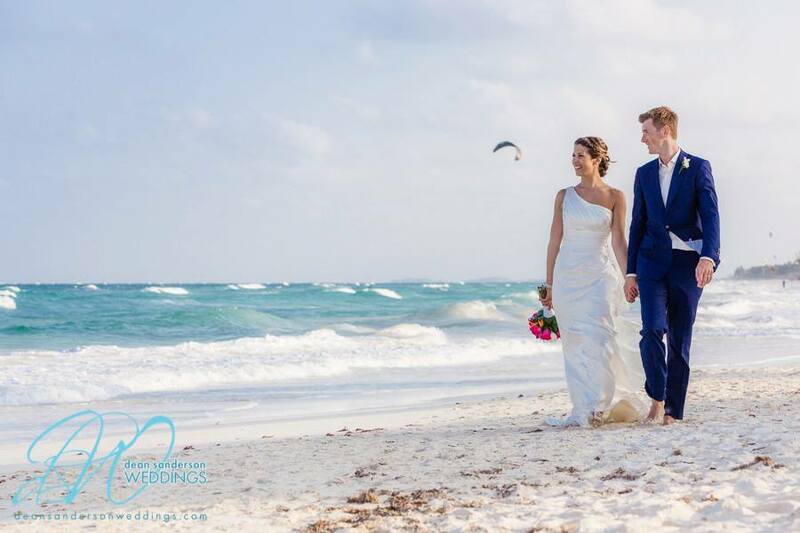 When we introduced them to the Grand Coral Beach Club, a modern, open air venue on a quiet beach in Playa del Carmen, they knew it was perfect. Roses, white accents and vintage chairs created a romantic and elegant look for the beautiful sea side ceremony. Danay’s vision for the ceremony decor was simple yet elegant, using strung lanterns and beautiful lanterns to light up the night and it came together beautifully. Fun and festive Mexican traditions like a pinata and a mariachi band gave this beautiful wedding just the right touch of fiesta! And the DJ kept this celebration under the stars going all night! Thank you to Fine Art Boutique Wedding Photography for capturing the love! 59 guests from England, Canada, New Zealand, Australia and the US came to gorgeous Tulum this past April to celebrate Andrea and Rob’s beautiful beach wedding day! 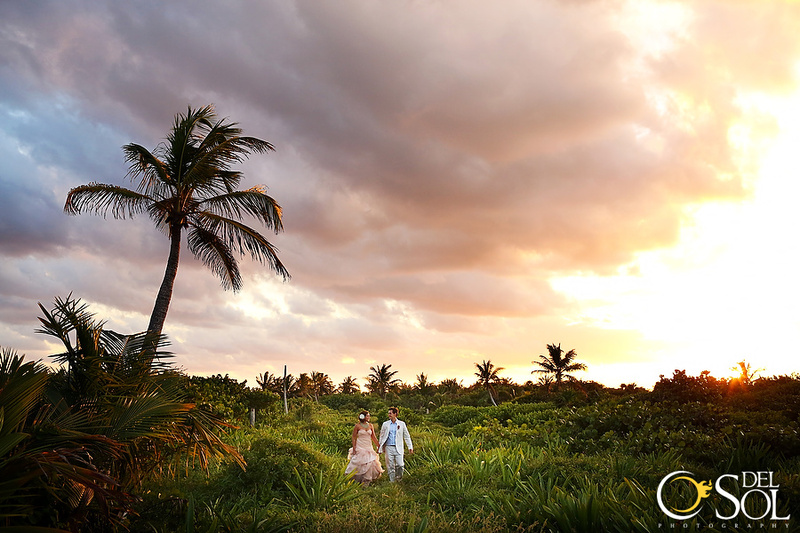 The luxurious Be Tulum and charming Playa Azul played host to the guests while Akin Tulum provided the perfect background for this romantic and spiritual union. 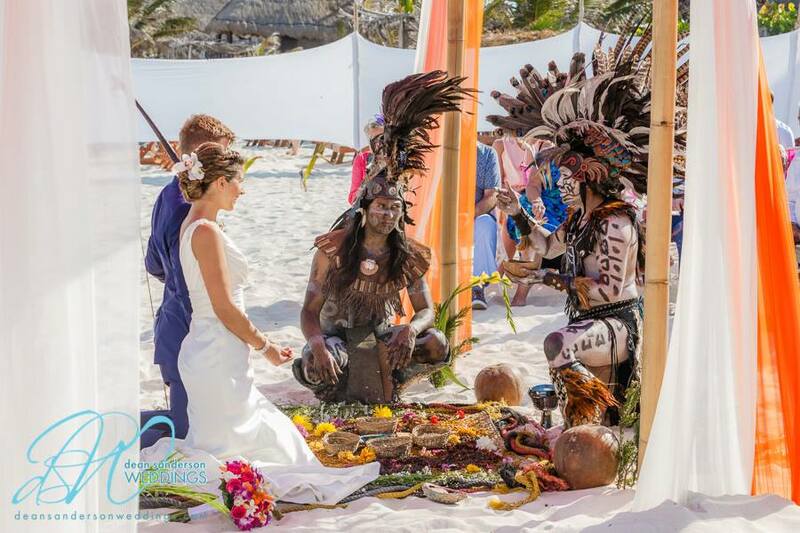 A traditional Mayan ceremony, performed by Shaman Miguel and 3 other Shaman, was followed by a fabulous performance by the famed Flamenco dancer Antonio Suarez and a beautiful celebration under the stars. Beautiful bride Andrea looked like a beach goddess with her braided updo and flowing one shouldered white gown, all photographed by the memorable Dean Sanderson!